Sussex batsman Harry Finch has stressed the importance of being mentally strong as he enjoys his best start to a season since making his debut five years ago. 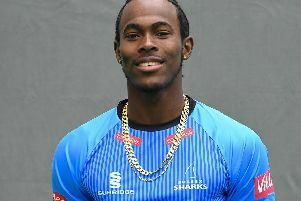 The 23-year-old ticked off two milestones in the space of a fortnight earlier this month when he made his maiden County Championship hundred against Middlesex and then scored his first List A century in the Royal London Cup tie against Hampshire. He has become a key member of Sussex’s top order and Head Coach Jason Gillespie has been impressed with his attitude to improving his skills and his commitment towards the overall team performance. During their trophy-winning years a decade ago, Sussex became one of the first counties to employ a specialist sports psychologist to work with the players. Michael Caulfield became such a key member of the backroom team when he was taken on by former coach Mark Robinson in 2006 that he recommended him to Gareth Southgate, who was then in charge of Middlesbrough FC. For the past five years Finch and the other Sussex players and coaches have had access to Tom Cross, a performance psychologist who has worked for the FA, Crystal Palace and several FTSE top 100 companies on specific therapeutic models which enhance performance. Finch has had little chance to do that this week after Sussex’s fixtures against Gloucestershire and Surrey in the Royal London One-Day Cup were both washed out. It leaves them probably needing to win their final two games against Glamorgan in Cardiff on Friday and Essex at Eastbourne two days later to qualify for the knockout stages. The Saffrons, where Sussex returned after a gap of 17 years in 2017, will be a new venue for Gillespie, who is a supporter of playing games at outgrounds. Sussex head to Arundel next month to play Durham in the County Championship.